Today’s the day to shape our lives. Let’s spark our Life. We are responsible for our own thinking. Even though others may lead you, it is up to you to be affected or not. That doesn't mean that others cannot teach you what is right and wrong. You should be open-minded to the teachings of others, and then make up your own mind about what is right for you, and if you will make the move to change or not. When it comes to the world, there is nothing more constant than change. In this current environment, we are all looking for a better way to get things done. We are looking for ways to do great growth for personal life and job, stronger corporate teams and, most of all, to increase profits. Those that stick with the traditional way might be sentencing their life or businesses to a slow and almost certain death. No one said that making changes was easy. It takes a lot of guts to change from what has worked in the past to what might work in the future. However, change is inevitable. You either decide to embrace this fact or you just might find yourself unchanged and thrown out of the world. Seat Back and think again. Make a difference. Stay motivated. We hope guys you find Quote "Only I can change my life. 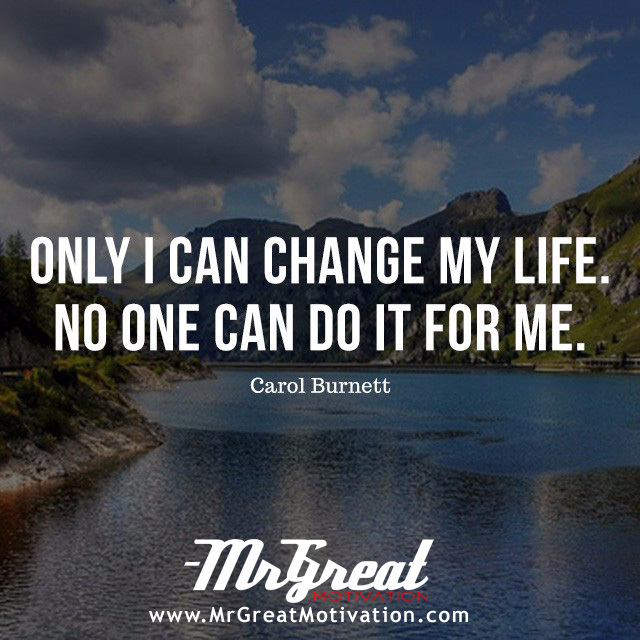 No one can do it for me - Carol Burnett" by Mr Great Motivations useful. If you think we have made some efforts, then don't forgot to appreciate us by sharing this Quote with your friends and family, And thanks for visiting.